In my book “Life Matches: Fire Up Your Life!” a book of matches is a physical reminder to use your personal strengths to fire up your life. Each match in the matchbook represents one of your many strengths or talents. Each strength requires a spark to light. What sparks your strengths? Maybe it was an encouraging parent, teach or coach who saw some smoke signals that hinted at your possible strength and helped you fan it into flame. Perhaps it was an experience which put you into close proximity to someone else’s flame that sparked you or it could have been the Holy Spirit’s faint whisper telling you it was your time to shine. Sparks can happen in many different ways. What sparked your interest? Please take a moment to share what or who helped you discover one of your strengths by sharing a spark. 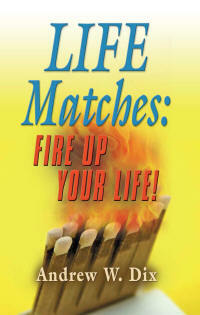 What or who helped you discover how to ignite one of your Life Matches so you could fire up your life? Please share your spark by clicking on the “Leave a Comment” link that is located under this post’s title. You might spark someone else’s strength by sharing your story. The list goes on…how much is enough for you? More…is probably not the best answer. One’s answer to “how much is enough?” is the only path to satisfaction. Insatiablilty for anything is an exhausting journey into maddening frustration. Always wanting more. Never satisfied. Enough is enough if one defines how much is enough. Are you ready to enjoy the peace that only satisfaction can bring? Perhaps it’s time to define, how much is enough? Why be consumed by your consumption? Can you accept that you want what you already have more than wanting more of what you do not have? You may be surprised do discover that you already have been blessed with more than enough. How much is enough? As for this post, this is enough words. How much is enough for you in various areas of your life? Please share your thoughts and comments. Two people both know what he/she would like to achieve. Both have the knowledge, skills and talent to meet his/her goal. Both have the same amount of time and resources to complete the goal. Why does one person act in ways that builds a path to success while the other person never gets started? Sufficient self-discipline is often the defining difference. Think of self-discipline as CHOOSING to THINK and BEHAVE consistent with your plan to make your goal and mission. It’s a combination of habits which allow you to delay immediate gratification, endure hardships, ignore temptation, fear, cynicism, criticism and judgment long enough to complete the necessary work which moves towards goal attainment. Self-discipline is CHOOSING not to put off until tomorrow, what needs to be done today. It’s listening to your conscience and actually doing what it tells you to do. Self-discipline is really hard to keep up. So, how do we get better at it? Recent psychological research suggests that our self-discipline is similar to a muscle. With practice, we can all increase our self-discipine’s strength like any other skill. 1) Know yourself and your limits. Take time to observe yourself and note when you display self-discipline and when you fail to do so. How rested were you? What was the environment? Were you well nourished and hydrated? How was your overall health? A corporate athlete needs to maintain adequate physical health to be able to train self-discipline. What triggered your giving into a thought or behavior you did not intentionally set out to do? Set yourself up for success by creating environments both internally and externally supportive to your self-discipline practice. If you need help, ask your friends and family for suggestions. They often can provide feedback on your behavioral blind spots and self-sabotaging habits. 2) Clearly define your mission, goal and plan. Specific, attainable, action steps and timelines are the best insurance to developing your self-discipline. What must you do next to get one step closer to your goal? 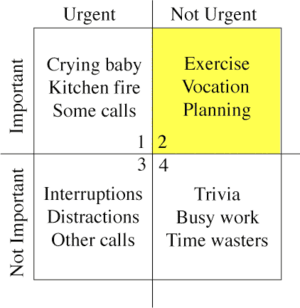 Ask yourself, “Is what I am doing right now the best use of my time to get me closer toward achieving my goal?” If not, do what you know you should be doing. 3) Set increasing self-discipline practice periods. Start with what you feel is a reasonable amount of time to practice your self-discipline by doing something that you know you should do, but don’t really feel like doing. Say, “I’m going to set a timer to do this for 5 minutes and then do what I feel like doing for 2 minutes and then I’ll come back and do this for another 5 minutes.” Keep track of your times. Gradually increase the amount of time you can practice your self-discipline. 4) Do what you dread doing most first. Delay doing what you love most to do until last as a reward. Work before play and put first things first. 5) Eliminate temptations and distractions. You know what tempts and distracts you the most from doing whatever you seek to accomplish. Eliminate or at least minimize temptations and distractions while your practice your self-discipline tasks. Focus is a required element in the development of self-discipline. 7) Accept responsibility for your choices, thoughts and behaviors. We each have the power to choose our thoughts and our behaviors. If we are not happy with our results, we can choose to change our thoughts and behaviors in ways that put us in a more successful position more successful. 8) Celebrate success…Anticipate failure. Developing your self-discipline is hard work. Celebrate each success that brings you closer to your goal. Also, anticipate that your self-discipline strength will fail you before you want it to. Don’t beat yourself up when your self-discipline reserve runs out. Recognize your self-discipline is exhausted, rest and recover. Review what happened and how it happened and learn from it. The goal is to get back to your self-discipline practice faster and faster each time you fail and not allow backsliding to unduly delay your progress or discourage you. 9) Share your plan. Sharing your self-discipline improvement plan with someone who cares about you can dramatically improve your chances of success. 10) Find role models. Seek out people who have developed their self-discipline and find out what techniques they use to expand their capacity. Experiment and see if you can incorporate some of their success tips into your development plan. The most consistently successful people I have met tend to be the most self-disciplined. They decide what they want to achieve and what needs to be done. Then they do each step… one at a time. Now it is up to you. What do you want to achieve? What is your plan? What can you do to get one step closer to your goal? Act, evaluate your progress, decide your next step, and then take it. “The first and best victory is to conquer self.”-Plato. Let me know what you think. Please post a comment or share your thoughts and opinions. Who knows, you might spark someone to fire up his/her life!